Two of my nieces have sinks in their bedrooms. They share a full bathroom with sinks, toilet and tub/shower combination, but they also have their own sink in each of their bedrooms. She thought is was a bit odd to have a sink in her bedroom so I asked her if she was interested in having a curtain hanging there also. That way she could tie it back or just open it when she wanted to use the sink and close it other times. She thought about that for a bit and decided it was a great idea. So, we talked about how to hang that curtain and the easiest solution was curtain(s) with a pocket and a tension rod. There is also a bulletin board that runs the length of one wall, so we planned to find some fabric to color that. She has always liked aqua, but when we talked about colors I learned that she now likes blue and green combinations and that led to a conversation about the wall color (they were going to paint the room.) There was a fabric store nearby, so we printed out a coupon (gotta love that 40% off coupon!) and headed out the door. We walked through the fabric area so I could get a feel for where the different types of fabrics where, then we started looking at specific sections and colors. My niece quickly picked out a blue fabric for the curtains on her window, so I tried to guide her to fabrics that would go well with that fabric. She ended up really liking a batik in a rainbow of colors. There was enough on one bolt to cover the bulletin board and we had to find another bolt of a slightly different color for the sink curtains. There wasn’t enough on that bolt for the sink curtains so we went and picked out a coordinating color (green) to use as a filler to get the length needed to hang in front of the sink. 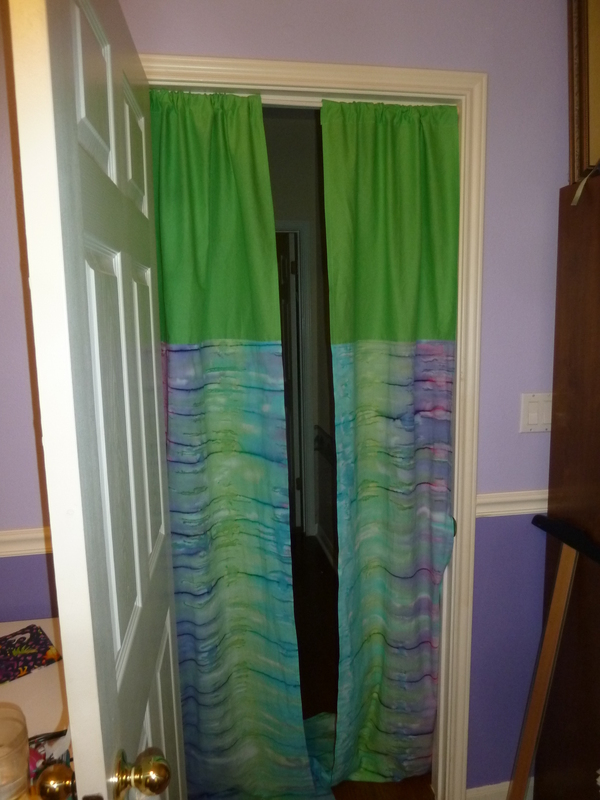 I really wanted to do the pocket plus a few inches of the green fabric at the top and have the rest of the green balance the curtain down at the bottom, but she really wanted all the green at the top. Her room, her choice and she loves how it turned out. Right after our fabric shopping spree, I headed up to the lake for a few days. I decided to wash all the fabric while I was there (there is a dryer there!) so when I got home to Texas I could just start right in on the sewing part of it all. I have mentioned in other posts that I am not a seamstress, but I can sew some pretty good straight lines. These curtains where right up my alley. 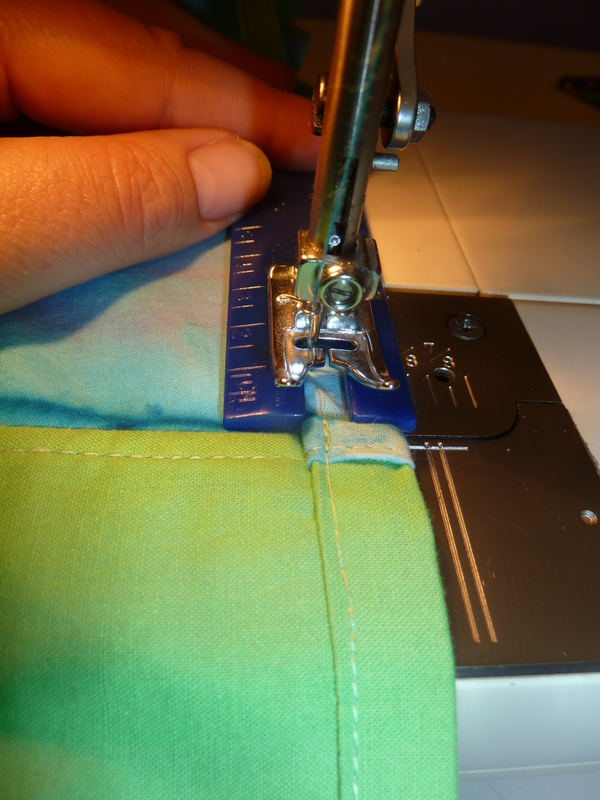 In the past, there has been one problem that I always run into when sewing seems that have many layers, and that is the bit bump that they create where your presser foot has a hard time getting over the top of the bump and my needle can get off course as I sew down the other side and the thread can bunch up. Well, I learned a trick….. and I will share it with you! I use a point turner! In the photo you can see it has a two little cut out areas. 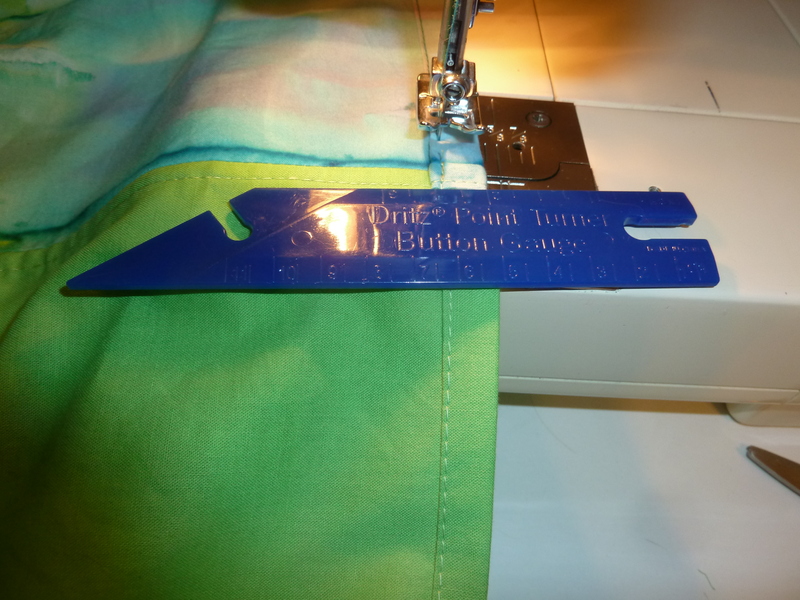 From behind, the side, or the front, you can slide it around your needle and help bridge the height different where the multi-layer seam is raised up much higher than the other part of the seem you are sewing. It works like a dream, maintains consistence for the presser foot and keeps the thread consistent too. The curtains where mailed off this past September, and my niece loves them. I am glad that I could be a part of the process and share this with her.